Arab arson suspected in massive Shabbat fire that spread quickly to within feet of homes, comes on heels of several other fires. On Shabbat (Saturday) morning, a suspected Arab arson attack was put out at the last moment before it reached the Jewish community of Einav in north-west Samaria. The fire, which is suspected to have been set by Arab arsonists in a deliberate attack on the town, spread quickly towards the community due to the oppressive heat and winds. 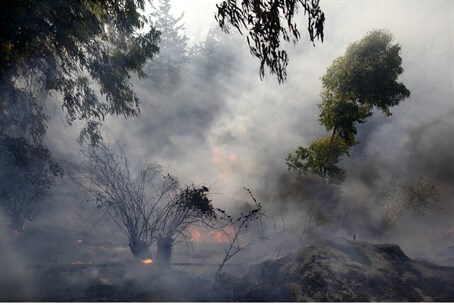 Residents of the community, along with a large firefighting force from Samaria, and even IDF Nahal Hareidi Brigade soldiers who were stationed in the area, took part in the desperate efforts to put out the blaze before it reached the town. The blaze fanned out, turning thousands of dunams (hundreds of acres) to ash, and coming within mere feet of the houses. The fire comes on the heels of several other recent fires suspected as being arson attacks, the largest of which was a massive forest fire that covered Jerusalem in ash and caused residents to be evacuated on Wednesday. Ultimately, residents of three streets, as well as Yad Vashem and Hadassah Hospital were evacuated due to the fire, and all vehicle traffic near the blaze was closed. A total of twelve homes were damaged, several people suffered light injuries from smoke inhalation, and the light rail between Denia and Ein Kerem stations was shut down. The fire came a day before two more blazes burst out on Thursday in Jerusalem and Carmiel in the north. The same day, the Jerusalem Magistrates Court extended by four days the arrest of a 20-year-old Arab resident of Abu Ghosh to the east of Jerusalem, suspected of setting a forest in the area on fire Sunday. Police say he confessed to the crime.